This breakthrough. 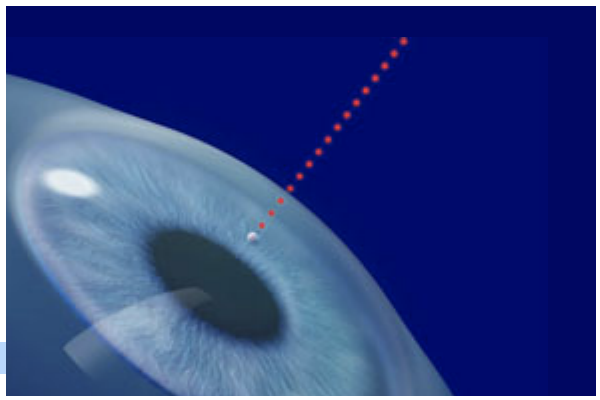 computer-controlled technology with its unique IntraLASIK® software provides the surgeon with a minimally invasive approach to creating the corneal flap for the LASIK procedure. IntraLASIK® provides remarkable accuracy, and may enable patients who have previously been dismissed as high risk to be re-evaluated for vision correction surgery. This level of precision reduces patient anxiety and significantly reduces or eliminates the possibility for complications that may occur with conventional LASIK . This level of safety is a first in vision correction technology. IntraLASIK® can truly make vision correction surgery one of the most rewarding decision of your life. A choice to be made with confidence. A. Conventional LASIK is a very good procedure. In fact, Dr. Turner has performed thousands of cases. While the risk of complications in his hands is very minimal, all surgery carries some degree of risk. Now, an advanced laser technology is available that significantly reduces the risk of complications. It is known as IntraLASIK®. Q. How is IntraLASIK® different from conventional LASIK? A. LASIK surgery is actually a 2 step process. First a flap of corneal tissue must be created and then folded back. The cornea is the transparent dome-like structure that covers the iris and pupil of your eye. By creating a flap in the cornea, Dr. Turner is able to perform the laser vision correction treatment on the inner layer of the cornea, which practically eliminates any patient discomfort and allows for rapid visual recovery. Traditionally, the surgeon created the corneal flap with a hand-held mechanical device which utilizes a metal blade. This method has worked well over the years; however, the performance of these devices can be unpredictable. Although LASIK complications are rare, this mechanical device is frequently the source for most of the reported complications. With IntraLASIK®, the surgeon uses the precision of a laser to create the corneal flap. The accuracy of the laser (+/- 10 microns) is unparalled by any other technology in vision correction surgery. This advanced technology puts unprecedented control in Dr. Turner’s hands, and even allows him to customize the corneal flap for every individual patient. Because of its consistent accuracy, IntraLASIK® now makes it possible to treat many patients who were dismissed as candidates for laser vision correction due to thin corneas. A. Yes. IntraLASIK® is considered by many to provide a safer approach to vision correction surgery. This is a result of the superior precision of a computer controlled laser as compared to that of a hand-held mechanical device. Q. Is conventional LASIK unsafe? A. No, but IntraLASIK® reduces the risk of complications reported with conventional LASIK. Q. Is IntraLASIK® new? How is the Turner Eye Institute able to offer IntraLASIK® when others in the area do not? A. The IntraLASE FS™ laser has been cleared by the FDA and became commercially available in 2001. The IntraLASE FS™ laser is the only laser that provide IntraLASIK®. The Turner Eye Institute is among an elite group of key opinion leaders in ophthalmology who continually evaluate advanced technologies and adopt them into practice as soon as they become both available and proven. Q. Is IntraLASIK® more expensive? A. Advanced technologies are more expensive for the surgeon, or laser center to employ in their facility. Most patients agree that the added level of safety and assurance offered by IntraLASIK® is well worth the additional cost when considering vision correction surgery. Q. Where can I get IntraLASIK treatment? A. The IntraLASE FS laser is centrally located at our San Leandro Laser Center.